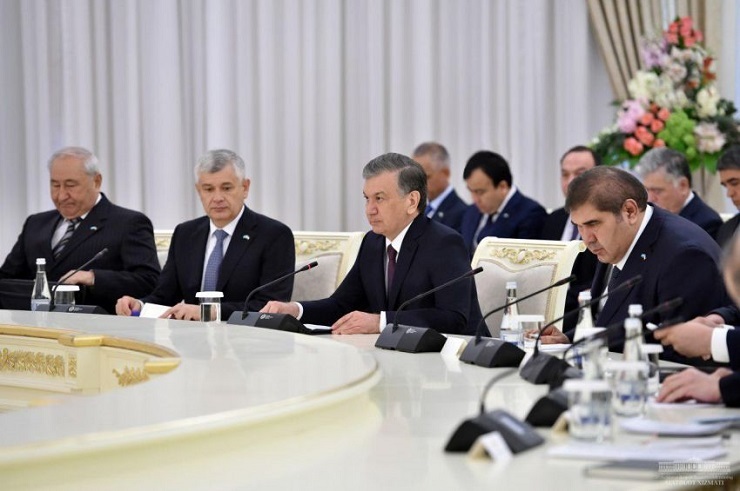 Presidents Shavkat Mirziyoyev and Kasym-Zhomart Tokayev continued the negotiations in an extended format with the participation of members of delegations represented by heads of ministries and major companies of the two countries. Uzbek-Kazakhstan relations are characterized by good-neighborliness, enduring bonds of friendship and fraternity. Bilateral cooperation has been actively advancing on all fronts. It was stressed at the talks that consistent implementation of provisions of the Strategy for Economic Cooperation between the Republic of Uzbekistan and the Republic of Kazakhstan for 2017-2019 will serve to build up mutually advantageous and fruitful interaction in the field with an eye to the common strategic interests of the two nations. Over the past two years, the partnership has risen to a new level. Contacts among regions and business circles of the two countries were intensified. As a result, trade and economic cooperation has been developing dynamically. The year 2018 was a breakthrough in this direction. The trade turnover grew by almost 50 percent and exceeded 3 billion dollars. The parties confirmed their shared desire to reach the level of 5 billion dollars in bilateral trade in the coming years. The Intergovernmental Commission on Bilateral Cooperation between Uzbekistan and Kazakhstan has been tasked with expanding the range of trade relations, search for and develop new long-term forms of economic cooperation. That would contribute to the consolidation and enhancement of mutually beneficial economic interaction, the realization of promising new projects in the fields of trade, investments, logistics, to the creation of integrated industrial technology parks, research and innovation clusters and free economic zones. 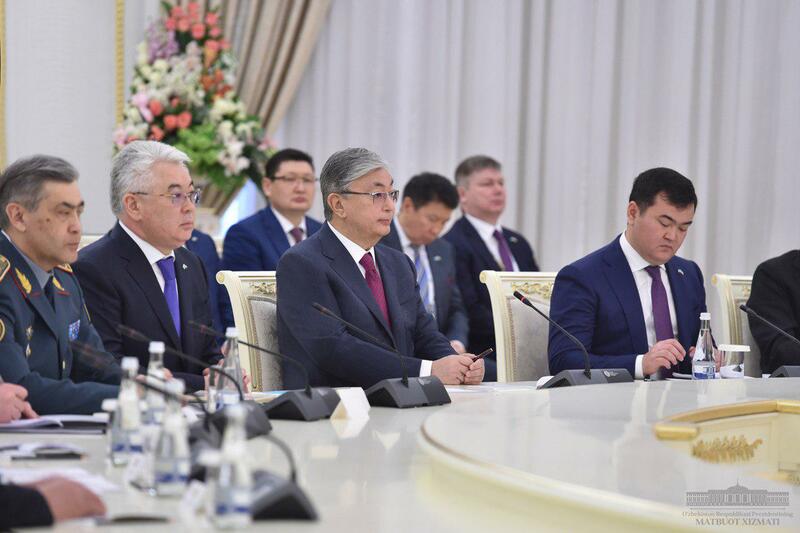 The two sides positively assessed the results of the First Forum of Interregional Cooperation between Uzbekistan and Kazakhstan, held in November 2018 in Shymkent, as well as the First Regional Economic Forum of the Central Asian Countries that took place this March in Tashkent. The heads of state welcomed the successful course of the demarcation process of the Kazakhstan-Uzbekistan state border as well as the effective operation of checkpoints, which has served to significantly improve the living conditions of the population in the border areas of the two countries, revitalize cross-border economic relations and humanitarian exchanges, and enhance the reciprocal travel of citizens. During the negotiations, agreements were reached on the implementation of joint projects in the field of transport, logistics and industrial cooperation. It was noted that the enlargement of cooperation in the transport and communications sector will expand the export potential and transit capabilities of our countries. The possibilities of boosting the exchanges in tourism, culture, science and education have also been discussed. The sides stressed the successful organization of the Year of Uzbekistan in Kazakhstan in 2018, whose events helped to further cement the relations of friendship and fraternity between our two peoples. The Year of Kazakhstan in Uzbekistan that officially opens during the state visit of the President of Kazakhstan will be a logical continuation of this large-scale occasion.